Many are the times, throughout his long history, when man has lost his way, but never, until now, has he strayed so far from his destined path. Never, before, has he been in such need of succour, and never, until now, has that help been so readily available. For long ages, the Law has restricted the measure of aid which might be given; man�s free will is sacrosanct and may not be infringed. Today, for the first time in countless centuries, more aid can be freely given than ever before. Today, at his moment of greatest need and despair, the bountiful hands of his Elder Brothers can open, and provide the succour he longs for. All that is required is the request from man himself. All that is needed is the readiness to accept the advice and wisdom of the Brotherhood, and to change direction. Many at this time of crisis have lost hope and wait fearfully for the end of all. They know nothing of the hope which fills their future and languish in the midst of change. Many more are impatient with the present and seek change at any cost. They feel the future beckoning with they know not what, and champ at the bit in their eagerness to experience the new. All are subject to the influence of the tensions and stress which characterize this time of change, and, in the light of their disposition, react accordingly. Into this complex situation the Masters make Their approach. They must so act that man�s free will is not transgressed, yet seek to help in every way the Law allows. Fine will be the judgement needed in many circumstances and cases until a modus-operandi is evolved acceptable to all. We, your Elder Brothers, counsel the democratic process, with full participation, as that which brings freedom and justice to each one. Nevertheless, there will be many times when Our age-long experience and vantage point in evolution will be to man�s advantage and betterment to accept. Thus shall we work together, the Teachers and the taught, in harmony and trust; and thus will man learn the ways of the past, of his forefathers, and so bring his aspiration into line with his preordained purpose. Thus will it be, and thus will man begin to realize the essentials of life, and begin to discard the multitude of useless attachments which today distort his vision, create his unhappiness and threaten his very existence. Soon, Maitreya, the Master of the Masters, will begin His open mission. Soon, men will be able to hear His teachings and assess them for themselves. Many will find in them the Truth so simply evident that they will quickly join His band of warriors and share His burden. May all who read these words be among them. Q. (1) Did licence to torture, or the creation of a climate in which torture and human rights abuses could take place, come from top echelons of the US administration? (2) Did Bush, Cheney, Rumsfeld, Powell, Rice, et al in the USA, and Blair in the UK, know about the torture? (3) Does the same apply to UK government or military top men? A. (1) Certainly a climate in which abuse was acceptable had been created. (2) Bush and Rumsfeld knew that a very hard policy, including torture, was in place. (3) No. Q. When the revelations about the abuse of prisoners in Iraq were at their height, a video was released on the internet apparently showing the beheading of an American, Nick Berg. There are rumours that he was not alive when he was beheaded. The video-counter on the film of the beheading shows editing, and �time-jumps�; the body did not exhibit the usual involuntary reactions normally associated with decapitation. It is also said that the men standing behind Berg were not Muslims, but possibly Russian mercenaries. (1) Was it staged? (2) If so, who killed him? A. (1) Yes. (2) Iraqi Ba�athists. Q. Was the Prophet Mohammed himself militant? A. No, on the contrary. He was, in every situation, a man of peace. Q. The concept of jihad is mainly interpreted to mean a holy war against non-believers, but is it not too literal? Could it be that jihad should be seen as a symbol for the struggle in oneself of the �higher� over the �lower�, just as Christians talk of the struggle against evil � to be overcome in themselves? Could you throw light on this please? A. No, jihad is not a symbol for inner struggle but is meant as a war against non-believers of Islam. The idea does not come from Mohammed but was incorporated into the teaching by later zealots. As Islam spread and grew in power, like Christianity under the same pressures and political ambitions, the teaching became distorted by fanatical elements and adapted to suit political ends. Q. How close is modern Islam to it original state, as presented by the Prophet? A. About 70 per cent. Q. Have all Holy Scriptures throughout the ages been given some sort of �protection� against too much misinterpretation or watering-down? A. No. All scriptures of all religions are distorted to a greater or lesser degree. The essentials of each persist. Q. Did Maitreya make use of the D-Day celebrations and the widespread outpouring of gratitude to the veterans of the Normandy landings to pour a spiritual blessing into the world? A. No. His spiritual blessing is daily sent into the world. On 18 August 1995, I decided to film, before their destruction, the ancient warehouses of an agricultural co-operative, located in the yard of Montivilliers station (suburb of Le Havre), France. I met there a young boy about 10 years old, slightly built, wearing bermuda shorts, a T-shirt and a cap. He told me he had come with his mother to collect some pieces of wood. Then, the conversation took another turn, and he started telling me about his previous life: I was surprised to hear such a young boy speaking about such matters. He told me he remembered he had been a young American soldier, and had died on Omaha Beach during the Normandy landings. He had gone to the graveyard with his parents, and found his grave. He told me, too, about his young friends who play at war, dressing up as soldiers. I said they must not do that � no more war. He answered: �Yes, I know, but it�s only play. Now it must be peace and brotherhood.� He also said his friends have met again, in this life, German soldiers, with whom they play now, having become friends. I told myself that if new generations had such ideas, the world would be saved. That young boy spoke as an adult: I immediately supposed somebody was speaking through him � but who? I have asked myself the question very often. On 16 March 1998 I went to see the Rolling Stones concert at Tokyo Big Egg stadium. It was a fantastic show and I really enjoyed it. Later, walking home, I suddenly noticed a middle-aged man who looked like an ordinary businessman walking in front of me. He was singing some kind of song cheerfully (I couldn�t catch any words at that time). I thought he was quite drunk and I had better pass him by, so I tried to walk faster and get ahead. I can walk quite fast, but amazingly he walked as fast as me. I failed to pass him, and had to walk behind him. I was feeling a bit annoyed. As I came up behind him, I could hear the song he was singing. It was a hymn in English! I was very surprised because usually most Japanese men sing a song like Japanese blues called Enka-song, or other folk songs. I wonder why he was singing a hymn in English so cheerfully and loudly? A Christmas carol in March? I had to walk behind him for a few more seconds and just after I took another route, he stopped singing. I still wonder who he was. (1) Several years ago in San Francisco, I was walking to the car after a lecture by Benjamin Creme, when I was approached by a young man. He said he was suffering from AIDS and could I help him. The next day word got around that many were using this ploy in the San Francisco area to get money even though they were healthy. On another occasion, against my better judgement, I had given a very pushy person some money even though I was afraid he would spend it on liquor. So for a time I was not very generous. Then the following incident changed my mind. I was riding my bike through Central Park in Boulder, Colorado, and passed a lonely, big-eyed young lady with the saddest eyes. She said she needed a place to sleep and would I contribute to her needs. I declined. I felt smug, yet guilty in saying no. However, I have never forgotten her big sad eyes. I decided that in the future I would donate even though I felt I had been contributing to fakers. Could this have been one of the Masters helping me to see I was being ungenerous? Mexican air force pilots filmed 16 unidentified objects in the skies over southern Campeche state on 5 March 2004, according to a Mexican Defense Department spokesman, and for the first time footage of the sightings was released to the media. The videotape, aired on television news around the world, showed bright objects, some sharp points of light and others like large headlights, moving rapidly in a late-evening sky. The lights, filmed by pilots using infrared equipment, appeared to be flying at an altitude of about 3,500 metres (11,480 feet), and allegedly surrounded the air force jet as it conducted routine anti drug-trafficking surveillance in the area. Only three of the objects showed on the plane�s radar. �Was I afraid? Yes. A little afraid because we were facing something that had never happened before,� said radar operator Lieutenant German Marin. �I couldn�t say what it was ... but I think they�re completely real,� added Liutenant Mario Adrian Vazquez, the infrared equipment operator, who insisted that there was no way to alter the recorded images. The plane�s captain, Major Magdaleno Castanon, said the military jets chased the lights �and I believe they could feel we were pursuing them. There was a moment when ... the screens showed they were behind us, to the left and in front of us. It was at that point that I felt a bit tense.� When the jets stopped following the objects, they disappeared,� he said. Janez Ferjancic: Before you were engaged in the Reappearance work you were connected with UFOs in the 1950s. You knew George Adamski personally. Could you explain how it all started, and what were your experiences with UFOs? Benjamin Creme: I first read about UFOs in Flying Saucers have Landed, a book in which George Adamski wrote, in the last chapter, his experience of meeting a Venusian in the Arizona desert. The book itself was not by Adamski but by an Englishman, Desmond Leslie. It was the history of flying saucers over many ages, in different parts of the world. It was research � historical, speculative to some degree, and it finished with Adamski�s actual experience. Next I read Inside the Spaceships by Adamski, in which he was taken up in a spaceship, a saucer, onto what is called a mothership. This mothership was Venusian, and he had long conversations with the Venusian Master who, I think, was the Master of the ship, the chief person on board. In any case He was a Venusian Master. These were very interesting conversations, and so for me the UFO phenomenon was more to do with the purpose, the meaning behind the flying saucers as they were called, than the phenomenon itself. The fact that people from other planets � some people think other solar systems but my information is that they come from other planets of our system � were concerned enough to visit this planet was interesting, but the nature of their concern was much more interesting. Their concern was that we should not destroy ourselves. That we should change our way of life, our way of organizing our world, not to destroy the world from an ecological point of view, and not to destroy each other in a war using nuclear weapons. It was a philosophical, spiritual discourse which he had with the Venusian Master, and that is what really impressed me about the book. When I first heard about UFOs it was in 1947 or 1948, perhaps 1945, when a few reports appeared in our newspapers that a passenger plane had come close to what we call UFOs. The pilot would report it, the people in the plane would see it happening. They would see these round, disk-shaped objects, sometimes quite close to the aircraft, flying alongside, either one or many. It happened quite frequently but not every day � or rather you did not hear about it every day. These reports were spaced out over a period of time. The first time I heard or read anything about them, before I read the Adamski book, I believed they were probably either American or Russian special planes that they were experimenting with, which were built on an entirely different system, not like normal airplanes; they were round, saucer shaped, and so we called them flying saucers. I thought at first that they were secret planes, experimental flying objects of Russia or America, or both, until I read the Adamski book, and then it became clear that there was something else going on, that they were perhaps from elsewhere. Then, in the beginning of January 1959, I was contacted by one of the Masters of our Spiritual Hierarchy and my work began � I have talked and written about it elsewhere. The work was with the Space Brothers, the people using the UFOs, and my Master acted as the liaison between us, so to speak. To me, the two became identified; the fact of having read Adamski left me very open to the possibility, although I had not thought very much about it. But I was immediately introduced to the flying phenomena and I was part of a group, of which Adamski was one, which met only out of the body. To the outer world, we worked secretly, but to ourselves there was no secret � we recognized each other and we were part of a committee and did certain work which was assigned to us which was all to do with the UFO phenomenon. In my experience, what we call UFOs, the flying saucers, come from the planets of our own system. Not from the Pleiades, or Sirius or somewhere outside our solar system, but from, mainly, Mars and Venus. A few other planets like Jupiter and Mercury are involved, but the vast majority of sightings of the UFOs come from Mars and Venus. Practically all of them are made on Mars, even the Venusian ones. They are Venusian in design, and they are quite distinct, different in design and technology, but they are actually constructed on Mars. And they are all constructed by thought. The people in physical bodies on Mars and Venus, Mercury, Jupiter and so on are not at the same level or vibration of physicality that we experience. We know only three aspects of the physical: solid physical, liquid physical and gaseous physical. Above gas there are still four further levels of physical matter which so far have not been discovered on this planet. When they are discovered we will understand a great deal more about the nature and origin of disease, the purpose of life on this planet and of the reality of life on other planets. The beings on Mars and Venus and the other planets are on the four higher levels of the physical. If you went to Mars or Venus you would see no one, but nevertheless they are in physical matter, and have bodies made of that subtle, finer physical matter to which we give the term �etheric�. We ourselves have bodies of dense physical, liquid physical, gaseous physical and the four etheric physical planes � but we have not yet discovered the latter. They have been demonstrated to exist by the great scientist and psychologist Wilhelm Reich, who was a colleague and one-time assistant of Freud. He died in an American prison in 1957. He was arrested for purporting to treat diseases with instruments which he claimed (correctly) attracted matter from the etheric planes, which he called orgone energy. He saw it as one vast plane of orgone energy, which he saw, rightly, as being everywhere in the universe, substanding the outer solid physical plane. Esotericists understand the etheric plane as four planes, becoming finer and finer as they go higher. The fourth etheric is just above gas, and is invisible unless you have etheric vision. The reality of this etheric energy, of what he called �orgone energy�, was demonstrated palpably by Wilhelm Reich in various simple experiments. Nevertheless, he was arrested because he used instruments which he called the �orgone accumulator�, boxes which accumulated the etheric energy of some levels, usually the two lower levels, the fourth and the third etheric, to treat diseases including cancer and various other diseases. In America that was deemed illegal. The Food and Drug Administration arrested him, refused to allow him to prove his work, and he died in prison. Unless one understands the reality of the etheric levels of energy as finer, subtler, levels of matter, one cannot begin to understand the UFO phenomenon, and one cannot understand the creation of crop circles � because they are all related. The crop circles are created by people, mainly from Mars and Venus, with a few exceptions from other planets. The vast majority of them are Martian, some Venusian, and they are all over the world. Crop circles are mainly in the south of England, but they have been seen in America, Canada, Australia, New Zealand, Peru � all over the world to a greater or lesser degree. Our planet, like all planets, has a magnetic field; its magnetic energy travels in lines and criss-crosses, and where these lines cross is formed, eventually, a vortex, a force centre. The space people, in making the crop circles, are replicating on the dense-physical plane these magnetic vortices in our planetary magnetic field. So there is the planetary magnetic field on its own level, and then a physical plane counterpart of that, which is being replicated by the space people who are manning the UFOs, and creating the crop circles. JF: Why are they doing this? BC: They do this in order to make the foundation on the physical plane for a new type of energy, a new type of technology using that energy, which eventually will be developed on this planet. It is a gift for this coming time, the New Age which we are entering, which we call the Age of Aquarius, a time in which tremendous new discoveries in the use of the energy of the planet and of the sun will be found and adapted. This will entirely change our way of life on this planet, and will lead to a control of universal energy such as we cannot begin to imagine. In the next 2,500 years we will reach a stage where we can travel around our solar system at will, and out into the galaxy, exploring first our own solar system and then the vast galactic area, using energy which does not work within the time/space reality. So that distance is annihilated, time is annihilated. People think that if you are going to send something into the galaxy, it will take hundreds of years, the people would die before they could reach anywhere that was worth going to, and they would never return. It is not true. People come from Mars and Venus, which are not so far away, but they are still a long way away by our reckoning of distance, but they come here in minutes. It does not take time, once you understand that time does not exist and that the space which you thought you have to cover to get from one place to another does not exist either, and in minutes you can travel vast distances in space. JF: Why did they choose crops for showing these patterns? BC: Crop circles are used because they are seasonal. You only have crops for a short time in the summer and autumn, and then they are cut down, and you do not see the crop circles. Then they will grow up again next year, and the crop circles appear in the same places, because they are recreated each time in the exact same point, so that the energy is put in that field, or whatever. If put where all the energy is put, crop circles would be, literally, all over the world, including in the sea, on mountains and in rocks where nothing is growing. They are allowed to be seen, made real as a crop circle, as designs in corn, because it is seasonal; then it is cut down. This is a tangential way, without infringing our free will, of telling the people of Earth that the Space Brothers, as I call them, the people from other planets like Mars and Venus, are here, are part of a system, and they work in a systemic way, not just as separate planets. They are helping this planet to develop the technology of the future, and also to make known, without being too strong about it, that they are here, that they are aware of us, that they are helping us, that they have a very spiritual intention in coming here, and that they are 100 per cent friendly and harmless. JF: It is very difficult to believe in the true nature of the crop circles, because there are so many hoaxes. Could you tell me what percentage of crop circles are genuine and how many are hoaxes? And why are people doing this? BC: There are, of course, some hoaxes. These hoaxes are a tiny minority, perhaps 4 per cent, of the real and authentic crop circles which appear all over the world. The ratio of hoaxes to authentic ones varies from country to country. In this country (UK) � because we have had so many crop circles and for so long � they are probably a bigger percentage than elsewhere. If you have more crop circles, you have more hoaxes. And in other parts of the world perhaps there is not such a conscious involvement of people with the crop circles, so they do not take the trouble to make them. To make a crop circle is hard work, and they are usually very obvious and very clumsy and badly made. How anyone can mistake a hoax for a real crop circle � if they visit the actual crop circles � astonishes me, because they are so perfectly made when they are authentic. They are made in seconds by the people using the space vehicle. First of all they think of a design, decide what the design will be. It may be very simple, and if you follow the sequence of crop circles, you see that they become more and more elaborate, more complex, as the years go on. First, for variety, and secondly, to show a complexity and a degree of ingenuity and design which would be beyond the range of any hoaxer. The hoaxes are usually very elementary, rather badly made. Why are they made? I would say, for two reasons. One reason is that they are made by people who are paid to make hoaxes. Newspapers, for example, do from time to time put up money and employ, say, a group of university students who have worked out a way in which you can make a crop circle of a kind, a rather simplistic kind, but that would convince a journalist. Journalists know no more about crop circles than anybody else, than the average man in the street, and yet they come along with their cameras and look at it, and they say: "Yes, it is a crop circle, a real authentic crop circle, how wonderful! ", and then Jeff and Peter, or Willy and Robert, come up and say: "No, we made it, yesterday, we made it! 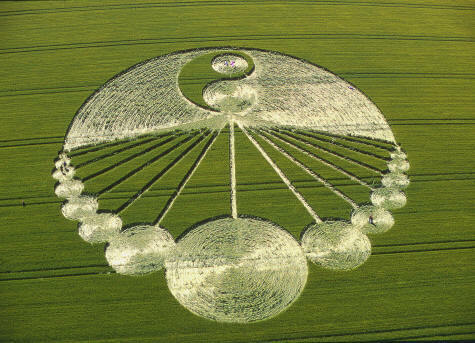 The Daily Mail or The Sun paid us �2,000 to make this crop circle, we can prove it. This is a complete hoax, they are all hoaxes." It is a way of diminishing the value and the reality of the crop circles. Also, I know for certain, that the Ministry of Defence in this country pays money to the farmers to cut down the crop circles if they appear in their corn. Some of them, of course, go ahead and as soon as a circle appears they cut it down. Even if the corn is not ripe and they would not normally cut down that area of corn for perhaps a few weeks or a month. And so you get fields with a great hole in the middle of the corn, which is where there has been a crop circle deliberately destroyed by the farmer � paid by the Ministry of Defence�. JF: In conclusion, do you think that without Maitreya we won't see UFOs becoming public knowledge? BC: Well, it is not the way I would put that. I would not say that without Maitreya we would not see it, but that with Maitreya we will see it. The fact that Maitreya is here � I know with absolute certainty that Maitreya is here, living here in London where I am talking now � will guarantee that the fact of our Space Brothers becomes known. He will begin His open mission very soon indeed. The world will gradually come to understand Who He is and what His mission is, and when they accept Him, then, of course, they will accept what He says about the Space Brothers and the UFOs. Then there will be an open interchange between them and us. Swami Nirliptananda is a senior swami in one of the temples of the Asian community in London, deeply acquainted with the teachings of Maitreya. During a recent trip to the Netherlands he visited the Share International Information Centre in Amsterdam where he was interviewed for Share International by Felicity Eliot. The following is a selection of fragments from Swami Nirliptanda�s fascinating spiritual teachings explained during the interview. �We live in a world of diversity, of relativity. But relativity presupposes an alternative reality. It presumes something else, and something else beyond that, until we come to the reality. Take shadow and substance: we cannot have the shadow unless we have the substance. So our cosmos cannot exist without some sort of inner power, which energizes it and keeps everything going. Maitreya�s teachings explain and as Benjamin Creme pointed up in his lecture on �Illusion� (SI Jan/Feb 2004) � that because we focus so much on the material forms in all their variety, through the senses, it is as if the mind absorbs all the information from the senses and becomes conditioned. The problem is that this process creates a wall between our consciousness and reality. The need then is to penetrate the wall, get rid of the conditioning and get back to a natural state. In that state we can see things as they really are and understand them as they really are. �The ancient sages state that OM is the sacred sound from which the whole of creation came into existence. Now, scientifically, if you investigated it and if it is that sound from which everything evolved, then it is obvious that this OM exists in everything. The sound itself has certain effects if you repeat it. Since it is the most vital part of our being or consciousness, if we repeat it we are creating a field or a process by which we are returning to where we came from. Extracts follow from a compilation of writings about The Marshall Plan featured in the July/August 2004 issue of Share International. Now that America stands alone as a superpower, it has the responsibility of creating a different world. It will only do so when the soul aspect of the nation demonstrates. �Through whom can it demonstrate? Only through the disciples and initiates because they are the ones who give expression to the soul aspect of any nation. It is up to the initiates and disciples to come forward with the ideas, the inspiring thoughtform of co-operation on a global scale, in line with the globalization which America has created in economic terms. There is not yet sufficient goodwill and trust between the nations to create the political counterpart, and so the competitive spirit, in line with market forces, the commercialization of all life which is part of market forces, dominates. �There is a strong fascist-type element in the US who are watching events and waiting for their opportunity [SI Jan/Feb 2001]. That opportunity would come when the changes are taking place to a certain degree, but they will find that the more educated elements of the public will take sides which they would not expect. They will take the side of change. You will find in the event that the soul quality of America, which is the second ray of Love-Wisdom, will be evoked by Maitreya, and will come into effect as it did after the Second World War with the Marshall Plan. The Marshall Plan is the greatest achievement of modern America, bar none. Unfortunately it stopped when it had done its immediate work in Europe, and it was changed into the CIA plan, which was to maintain the status quo, destabilize left-wing oriented countries, and keep the US ahead. It is still a very powerful agency, but it too has an end-time.